Much of this website has focused on recent media events such as the earthquakes in Haiti and Chile, and the catastrophe of BP’s Deepwater Horizon oil spill in the Gulf of Mexico. It is true, part of my plan for this site is to provide you with a sort of insider’s view as to what geology is and how it plays a role in events such as those which you have been hearing about in the news. Indeed, geology plays a deciding role in the dramas that have been unfolding before us. It is imperative that the people developing methods to prepare against the threats of earthquakes and volcanoes, as well as man-made disasters which directly involve environmental resources, educate themselves of the geology behind these happenings. By understanding this, it is possible to take the necessary remedial steps that are needed to limit the effects of such disasters as much as is possible. While I enjoy writing about well-publicized occurrences as much as I hope you enjoy reading about them, if you’ve read this site’s About page, you most likely expected to see more posts about my own work and experiences. My main excuse for not sharing these is that, as of late, I have not had many trips out into the world beyond my backyard. Not to mention that a volcanic eruption that effects the travel habits of millions of Europeans and tourists, and other such events, seems, to me, of far greater interest than my own predicaments. Fear not, there will be a posting soon on the happenings of the Gulf Oil spill and the hows and whys to whether most recent attempt to plug the leak has worked or completely backfired. However, as promised, stories of a real-life geologist and his adventures of past, present, and future will begin to fill the pages alongside the occasional news item. I did have a pleasant, be it muddy, experience this past weekend. 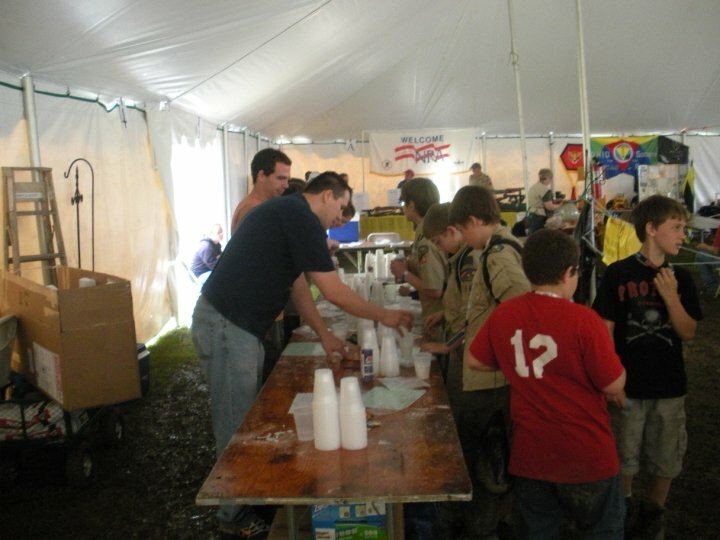 The decadal Boy Scout Jamborall, this year celebrating the 100 year anniversary of scouting in the United States, was a three-day event spanning the weekend. On Saturday, there were two white big top tents which had been set up a day or two ahead of time, but obviously after it had rained for some time. Under these tents were a multitude of folding tables and chairs set up to house displays of every kind from local historical societies, branches of the military and law enforcement, the Akron zoo, several outdoors and sporting clubs, and science displays, one of which being the Kent State Geological Society, of which I am a member. KSGS was invited to attend the event and, not passing on a chance to start-up a public awareness campaign, the club jumped at the opportunity and enlisted a large number of its members to volunteer to help. Our display consisted of a Psittacosaurus skeleton fossil cast, a poster showcasing photos from many KSGS and the department-led field trips to locations all over the United States, a culmination of several members’ rock, mineral, and fossil collections, including a few samples of my own, and a complete setup for the younger scouts to “make their own fossils” using plaster, coloring dye, and plastic molds of trilobites, dinosaur claws, and other various ancient lifeforms. 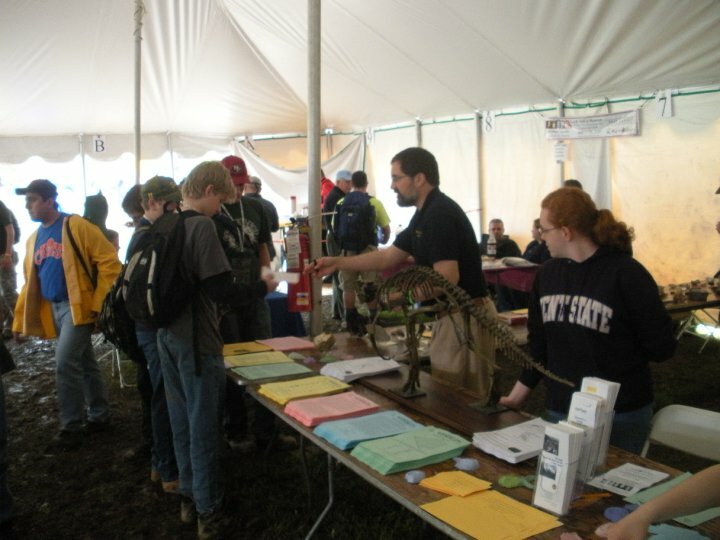 The latter of the three proved to be the most popular, while some older scouts and even leaders and people from other displays found interest in the rock collections and various handouts that were available explaining such things as Ohio’s geology and where to find fossils within the state. The ground under the tents was nearly as muddy as that outside. Due to the ever-present threat of rain here in Northeastern Ohio, the sides of the tents were all closed most of the day, with the exception of one end which acted as the entrance. The weather itself, as usual, could not make up its mind and went from blue skies and sunny to dark gray clouds and pouring rain, and back again several times throughout the day. The smell of mud mixed with rain and french fries from the nearby concessions was trapped under the canopy. The mud itself was only an inch or so thick, but this proved plenty for two cars in the make-shift parking lot in the lawn to get stuck, tires spinning, as myself and several nearby scouts helped push them along until they regained traction. During the sunny times, the mud outside started to dry up and, because in shade, the mud not only persisted under the tents, but grew deeper as more and more scouts trampled through. 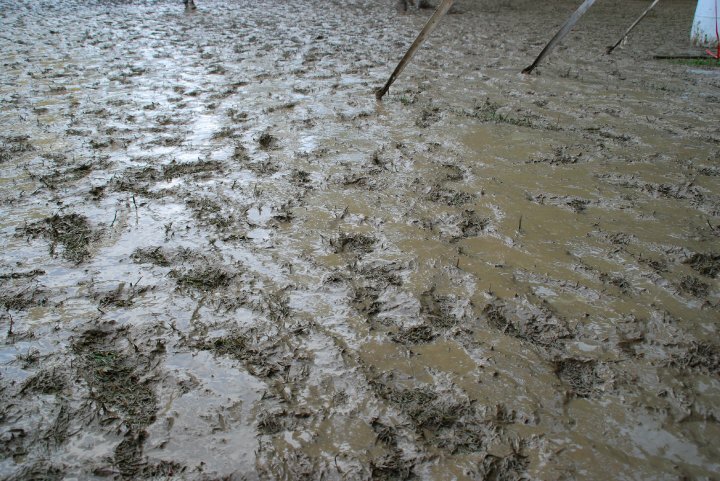 After several periods of rain, the mud became a four-inch thick sticky slurry which blanketed the ground wherever you walked. Scouts making "fossils" with the help of KSGS members. While attending the rock and mineral table I was thoroughly impressed by a young scout whom proudly declared he is an “aspiring paleontologist.” Regretfully, I forget his name, but a friend of mine, upon hearing this story, likened the scout to Timmy from the first Jurassic Park movie, so this name will do for now. Timmy proceeded to put my knowledge of dinosaurs to shame as he carried on what seemed like a 30 minute long conversation, but had to be no more than 5, about various dinosaurs of which I have never heard. All the while I am trying my best to carry on the conversation while simultaneously wondering what ever happened to Tyrannosaurus and Triceratops? What about Velociraptor? Kids think those are cool! But no, Timmy wanted to talk about strange and new species I’ve never heard of until this moment. I finally came clean and explained how, while I was once as enthused about dinosaurs as he (this was an exaggeration, though I didn’t think so when I was his age), I am an engineering geologist and don’t really know all too much about dinosaurs anymore. Timmy seemed a little disappointed, but perked up when I directed him to someone else whom I thought may be able to continue on with his conversation with a little more intellect in the subject than I. Timmy must have been no more than 12 years old. Though the rain and mud made their best attempt to the dampen the spirits of the over 2,500 scouts and 1,000 leaders and parents in attendance, the event proved to be a success not only for the scouts, but for KSGS. As we were breaking down and packing up, one of the leaders in charge of organizing the Jamborall informed us that we were one of the most popular tables, adding “You can tell by how deep the mud around your display is!” I enjoyed participating in the event and talking to people who found geology to be much more than just rocks and dirt…and mud. The mud which everyone enjoyed trudging through.